In e-commerce shipping, the cost of shipping plays an important role in the overall order fulfillment process. Both sellers and customers need to have a good idea about the types of shipping, how the shipping rate is managed for these, and other factors. Most of the store owners define the shipping rates by using Flat Rate or Standard Shipping. Flat rate is a regular shipping rate that is applicable for all types of shipping, irrespective of the weight, size, and dimensions. In Standard Shipping, the rate of shipping differs according to the weight, size, and related dimensions of the package. Some of the store owners offer free shipping to the customers. It is a good method which helps with conversion. However, it also eats up the profit you are getting. One of the leading causes of an abandoned cart is that buyers think that the cost of the shipping has made the product more expensive. 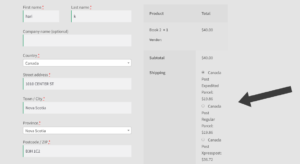 The best way to earn customers is by displaying the shipping rates at the checkout page so that the customers will know the rates provided by different carriers. How to get Canada Post Shipping rates? Canada Post Shipping Rates or Canada Post parcel rates are nothing but the cost of shipping a package. Different courier services (like Canada Post, FedEx, etc.) will charge different amounts for shipping the products. In most cases, the cheapest rates are provided by the government-controlled Couriers. Here are the Canada Post shipping rates for a package. What are the factors affecting Shipping Rate? The shipping rates for different items are determined by measuring the weight of the item. The more the item weighs, the more it will cost to ship it. Similarly, when the number of packages increases, the shipping cost will increase. Pretty self-explanatory! The dimensional weight refers to the size of the box you are shipping. The size of your box takes up space on the vehicle it’s being transported in. The more space that is taken up when compared to the actual weight is what determines the shipping cost for that particular order. The factor used in the formula to calculate the dimensional weight of a parcel will vary depending on product type, where dimensional weight is calculated as: Length x Width x Height / Dimensional Weight Factor. The value of the dimensional weight factor depends on the services provided by Canada Post. For example, for Priority, Xpresspost, and all USA/International Parcels, the value is 5,000 when measuring in centimeters and 139 when using inches. For Expedited and Regular Parcels, the value is 6,000 when measuring in centimeters and 166 when using inches. The further the package needs to be delivered, the more it will cost. In the case of International shipping, along with this shipping cost, taxes and duties are also applied to shipments. The shipping cost also varies for commercial and residential addresses. This is because it’s less expensive to deliver to clustered commercial addresses than to residential areas often scattered. This is basically the delivery time expected by the customers. If they want their package to be delivered quickly, they may select such services. For eg: Canada Post has the service of Priority Worldwide. 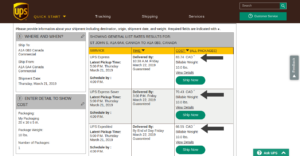 So, if a customer wants the package to be delivered on the next day, then he may select this service which will cost him more than the normal delivery service by Canada Post which will take around 7 days to deliver. In StorePep, the lowest shipping rate from the integrated couriers is automatically selected. As a government-controlled courier, the cost of shipping using Canada Post is much lesser than other couriers. 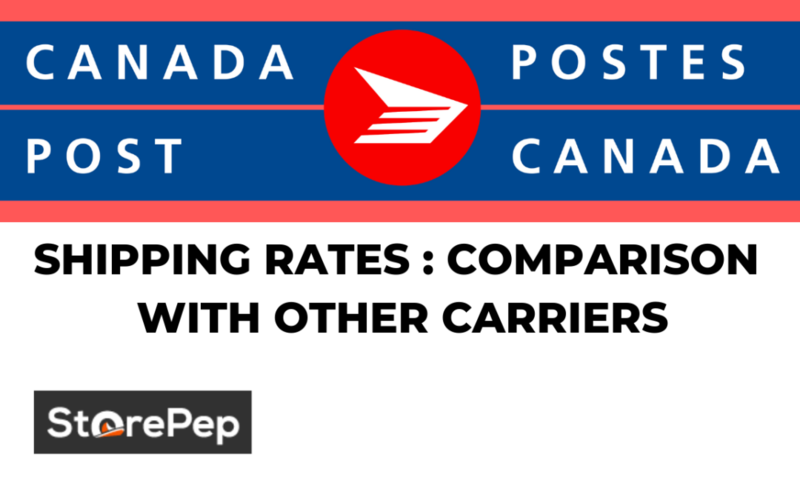 First, let us compare the Domestic shipping rates using Canada Post and other courier services. For example, a package has to be shipped within Newfoundland and Labrador (A1A 0A4 to A1A 0B3). The shipping rates for different carriers like FedEx, UPS, and Canada Post are given below. When you compare the rates given by these couriers, you can see that Canada Post parcel rates are much cheaper than other courier services. Now, let us compare the International shipping rates using Canada Post and other courier services. For example, a package has to be shipped from Newfoundland and Labrador, Canada (A1A 0A4) to Bangalore, India (560043). The shipping rates for different carriers like DHL, FedEx, UPS, and Canada Post are given below. So, when you compare these courier rates with Canada Post shipping rates, you can find that even for International shipping, Canada Post parcel rates are much cheaper than other couriers. Canada Post provides different services for Domestic Shipping, shipping within the US, and International Shipping. This includes the services that Canada Post offers for shipping within Canada. There are three main services, Priority, Xpresspost and Regular Parcel. 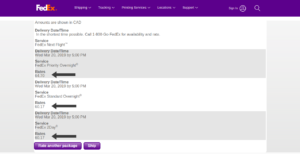 Lettermail is one of the easiest and cost-effective ways to send personal or business messages, invoices, and billing statements within Canada. Lettermail includes letters, postcards, annual, or quarterly reports of a business, invoices, CD or DVD, and dry biological specimens. Lettermail is categorized into two: Standard and Non-standard or Oversized. Standard Lettermails are the ones which meet the size and weight requirements as per Canada Post standard. Non-standard or Oversized Lettermails are the ones which do not meet these requirements. Lettermail Format: Standard size Lettermail envelopes and must be fully sealed on all sides. Customers mailing unsealed envelopes or newsletters not enclosed in envelopes are subject to Other Lettermail Prices. StorePep is a one-stop shipping solution for any eCommerce store, which has a unique feature of displaying the shipping rates of different carriers at the checkout page. The customer can select their desired service of the particular carrier. But this is possible only if the Store owner enables multiple carriers in his StorePep account. If he enables only one carrier, for eg: Canada Post, then the customer can see the rates related to Canada Post. 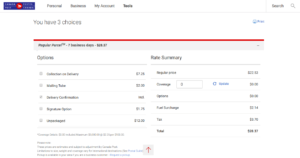 Let us see how to show Canada Post shipping rates at the checkout page using StorePep. Step 1: After your store is configured in StorePep, you have to select the carriers you prefer. Select Canada Post from the list of carriers. Step 2: When you select Canada Post from the list of carriers, StorePep will ask for credentials for Canada Post integration. When you click on “Get Credentials”, you will be redirected to the Canada Post “sign in” page. You have to sign in with the Canada Post account. If you don’t have one, sign up with Canada Post and create an account. 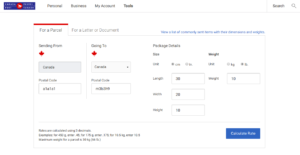 Step 3: Once you have signed into the Canada Post account, you will be redirected to your StorePep account where you have to fill in the Canada Post account details and then connect it with StorePep so that Canada Post is integrated with StorePep. Now, you have to enter your store address. Step 4: Give the details of your store and “Add” your store address to StorePep. As an example, here a sample Canada address is given. For easiness in identifying the address, the “Address name” is given as Canada. 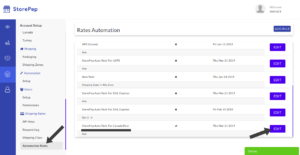 Step 5: Now, click on “Automation rules” which is present at the bottom of your dashboard. When you click on Automation rules, you can see some statements. 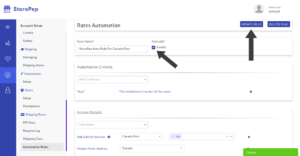 As soon as you integrate Canada Post into StorePep, a set of rules is automatically added in StorePep. These are “StorePep auto rule for Canada Post”. 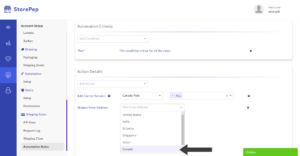 Step 6: When you open the StorePep Auto rule for Canada Post, under “Action Details”, you can see that there is an action automatically added. This means that at checkout, all the Canada Post services will be displayed. 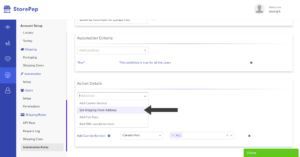 Step 7: Under “Add action”, click on “Set shipping from address”. Set the shipping from address to “Canada”, which was saved as the “From address” in step 4. 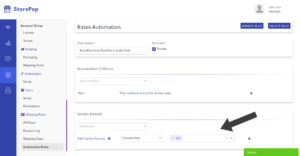 Step 8: Ensure that the StorePep auto rule for Canada Post is enabled and then “Update rule”. This article shows the Canada Post shipping rates and a comparison of Canada Post rates with other carriers. 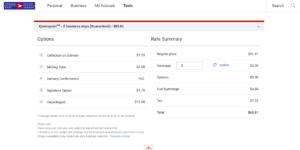 It also explains how to show Canada Post parcel rates at checkout page using StorePep. This would further aid in selecting the desired service. StorePep makes the shipping experience seamless for store owners using Canada Post. Please reach out to our support team if you have questions pertaining to Canada Post shipping. We will definitely get back to you and help make your experience a wonderful one.